Hiroco Ichinose’s quirky animated shorts have been delighting festival audiences since 2006. The Last Breakfast (2006), Ha・P (2008), and Cow’s Day (2009) combine stylistic sparseness with a touch of the surreal much like the films of her mentor Taku Furukawa. Her most recent independent work, Two Tea Two, has a very tactile feel to it, with its inky lines drawn on a textured paper. An alarm clock rings, awakening a long-haired woman with an angular face sleeping naked in her bed. She tilts her head and contorts herself into a round shape, as if stretching her body awake. She rushes off-screen and we hear a door close. She reappears again in a loose fitting dress. The sound suggests she is now on a public street and we see her gaze in a window, her face reflecting in a window as if she were a two-headed creature as she observes a cup of tea. Cut to the woman seated in a low chair, her body oversized and contorted, as she tries to drink from her tea cup. She looks up and a lovely short sequence unfolds in which we see traces of the world outside the café window – black ink on yellow paper. A shadow of another female figure appears outside the window looking in at our protagonist. Two women or the woman’s face reflected in the window? She tilts her head inspecting the reflection of herself. When she straightens, her mirror image remains contorted. She pokes the contorted mirror image of herself and the mirror image rounds into her chubby form again, knocking the lid off the sugar dish as she floats to the other side of the table. A small insect spreads its wings and scurries past the sugar dish. 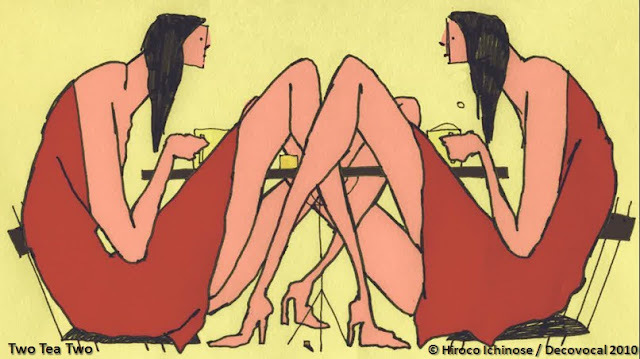 We now have two identical women – or the same woman reflected – sitting in low chairs facing each other, with the coffee table hidden under the tangle of their long legs in high-heeled shoes. They stare at each other, steaming tea cups in their hands. In a split screen, the mirror image appears to speak to her original. The woman with her bare shoulders above the red dress now stands in a storm, her long black hair streaming to the side in the wind. A second head and long neck appear – a two headed woman staring at the audience. She then curls herself into a ball and floats away. Back in the café, the winged insect wanders around a stray sugar cube on the table. It splits in half then reforms before munching on the sugar cube. The chubby version of the woman jumps past the cashier with a chink of change hitting the counter, then sheds her clothes as she jumps off screen. A door squeaks as it closes on the vignette. The alarm clock rings as the end credits roll. The animated short finishes with a reprise of the city setting and the woman jumping to the coffee table in her two-headed form. For me, Two Tea Two captures the ambivalent relationship many women have with their bodies. Rationally we may have come to terms with our physical selves, but first thing in the morning, pre-tea/coffee and depending on what phase of lunar cycle it is, our bodies may feel heavy and bloated. Looking bleary eyed in the mirror or at one’s reflection in a café window first thing in the morning, it is not unusual for a woman to search her own face as if it were a stranger’s, trying to reconcile our external selves with our internal selves. I love the little touches in this animated short of the action of city life passing by in fragments, and I identify with the feeling of being elephantine and klutzy in a tiny café. This is a nice film to watch together with Aico Kitamura’s Getting Dressed (2010) as both films explore the relationship between a woman’s physical self and her state of mind. Hiroco Ichinose (瀬皓コ, b. 1984) is, together with her husband Tomoyoshi Joko, one half of the creative animation team Decovocal. She is a graduate of the animation department of Tokyo Polytechnic University, where she has taught part time since 2009. In addition to her independent animated shorts, Ichinose has worked on commercial animation including the Rita and Whatsit and Bee TV animated TV series.